We would be delighted to hear from you if you have memories of going to Box School, of the teachers and lessons there and of your fellow pupils. Just click on the Contact tab above. [When the 1870 Education Act made education compulsory for children less than 10 years of age, Box needed a large school premises to accommodate infant and primary children and a new building was constructed on the main road in 1874-5. It is an imposing Gothic building on the High Street, built in a grand style with two projecting wings to symbolise a new start for Box's children. 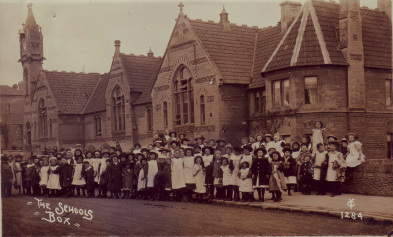 In 1891 admission to the school was made free and to cope with the increased numbers an extension was built on the school in 1894[see Historic Buildings article]. By the turn of the century most local children had been through an education at Box School and the building became a greater focal point when a clock was installed in the spire in 1896 as a permanent celebration of Queen Victoria's Diamond Jubilee. The school had settled down and was 40 years old when Katherine went there in the 1910s and most children attended until at least 13 or 14. You can discover more about the success of the school in our article about Box before the War. Click on the Great War tab above. In school the five-year-olds were looked after by the elderly Miss Smith. Under her kindly tuition we drew 'A's and 'B's with our fingers in the sand spread on shallow tin trays. It was easy to shake the sand level and try again. We progressed to using slates and I well remember how the slate pencils scratched and set our teeth on edge. Even at this early age girls had sewing lessons. We practised hemming and running stitches on small pieces of material. To help both boys and girls lace their boots and shoes we threaded coloured laces into eyelets punched into six-inch long strips of leather, split between the holes like the front of a shoe. We were shown how to close the gap and how to tie a bow at the top. At six years old, we moved into another room where Mrs McIlwraith taught us how to write with lead pencils on lined paper. The lines were printed in groups of four and our upward loops had to touch the top line and our downward loops reached the bottom line. We joined our letters together from the beginning. While listening to Mrs McIlwraith reading us stories, she made us sit with our arms behind our backs. This prevented fidgeting and was particularly good for our posture. In this class we learned to spell simple words, to read and do sums. We relaxed by drawing pictures and singing songs. Mrs McIlwraith, who was in sole charge of the Infants school, was called the Governess. Mr Druett, the headmaster, supervised Standards VI and VII. All the Standards had a teacher and so with those in the Infants School there was a staff of eight to educate the two hundred and fifty pupils there in my time. Staff who did not live in the village took lodgings near the school, although Miss Drew of Standard III cycled daily from her home at Thickwood, some way beyond Colerne. In Standard I we began to write with pen and ink. The nibs often crossed causing the ink to splutter all over the paper and we often made blots. Each double desk contained two holes for inkwells. These were filled with ink made from a powder. The mixture could thicken and come out in lumps or block the inkwells altogether. Periodically we had to remove these white china containers and wash the wretched things. Gradually we coped with the difficulty of using ink, and managed to write compositions, dictation and spelling tests. Mr Bradfield who looked after Standard V was an organist and choirmaster at the church so he gave singing lessons to the older children. Every year he trained a choir to compete at the Wiltshire Musical Festival held in the Corn Exchange at Devizes. For several years running Box School Choir won a shield for singing or sight-reading or for both. Villagers would linger outside the school to listen to the choir practising before the great day, and eagerly await the return of the charabanc carrying the singers home. The children would hold their trophy aloft in the open-topped vehicle as it entered the village and revel in the cheers and congratulations of their parents and friends. Practical subjects had their place too. Girls were given sewing lessons on two afternoons a week. Useful garments were made and sold to parents and teachers. All materials were provided by the school authorities in the first place, so money from sales was welcome. Knitting, darning and patching were also practised in these classes. Mr Druett's room was often required for other purposes. Being private, it became a consulting room when the school doctor was called, and a surgery when the school dentist's skill was needed. Also in that room, erring pupils received the wrath and sometimes the cane of the headmaster. Regularly on Wednesday mornings, Standards VI and VII were evacuated from their room, so that it could be used by the senior girls for cookery lessons. The old but empty high-mantled fireplace was large enough to accommodate two iron gas cooking stoves and in one corner of the room was a shallow sink with a cold water tap. Incidentally this tap and those over the wash-basins in the cloakrooms were the only ones in the school. There was no hot water supply. Cupboards built along one wall of the room held all the cooking utensils and the girls worked around a big well-scrubbed table, which was at other times the headmaster's desk. I dreaded joining the cookery class as I had a secret fear of lighting the gas. At home, we had only oil-stoves. Gas was a fuel of which I knew nothing, and I was unsure of what would happen if the lighted match failed to ignite the jets. I imagined the worst - an explosion or perhaps a fire! However, I did enter the class and I cannot remember anything untoward happening. Maybe I was never asked to light the gas. Miss Horler from Standard IV was our teacher and showed us how to make cakes, pies and puddings. We also cooked a small number of dinners, and these meals, previously ordered, were purchased by members of the staff and some of the pupils. Everything we made was sold to recoup the cost of the ingredients we used. Shortly before I moved to my next school, a new activity took place in the headmaster's room. A battery-powered wireless set miraculously arrived at the school, and was given pride of place in this room. Once a week, the children in Standards VI and VII were privileged to listen to and join in a BBC singing lesson. There was a competition to compose a tune to a set verse and one of the Box boys, Percy Head, entered and did well enough to have his tune played over the air. It was a proud moment when we heard his name and our school mentioned on the wireless. On the 24th of May came Empire Day, a celebration now erased from the calendar. Box school children looked forward to the 24th, as after morning prayers every pupil became an important person for the rest of the day. Boys and girls from the top Standards dressed up as people from the various countries of the British Empire. I well remember representing India, swathed in a sari made from a long curtain, and wearing several strings of beads around my neck. All the other children were given strips of strong white paper bearing the names of famous persons from our own country. These paper sashes were pinned across the chest of every pupil, in the way the Royal Orders are worn. The sliding screen dividing the upper school from the lower would be pulled back to expose a stage formed by planks placed across long wooden desks at the back of Standard III's room. The shields won at the Musical Festivals on that wall made a splendid background. Displaying their costumes and famous names the children lined up facing the platform in readiness for the arrival of the vicar and the school governors who were then seated on chairs on the temporary stage.With the scene set and everyone in place, the guest of honour, a retired major or captain from the district, would be introduced by the headmaster. The military gentlemen would then stand up and talk to us about our wonderful Empire and tell us how fortunate we were to be British. In our turn we sang patriotic songs, ending with the National Anthem. The visitors took their leave and all the children, now more relaxed, marched in a procession to the War Memorial passing the interested villagers who were standing along the way. 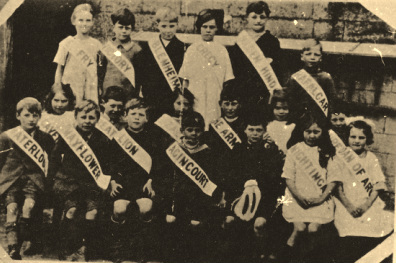 Afterwards each Standard had a group photograph taken. The setting was the boy's yard at the back of the school. On Empire Day, as well as being perhaps Lord Kitchener or Queen Victoria, everyone would be wearing their best clothes ready for the camera. The sadness of relinquishing famous names and handing the paper back to the teachers was short-lived as the rest of the day was a holiday.